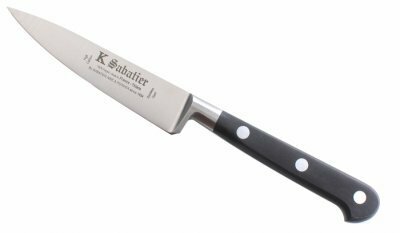 Authentic Sabatier Forged Knives. The whole knife is forged in a single mass of CARBON steel. The steel, Rockwell 54-56 HRC, is tempered, ground and polished crosswise to produce a high-quality tool, great cutting power, cutting hardness and balance. POM handles are manually set and mounted on the tang using three through rivets. From forging to packaging, we guarantee that all our operations are performed in the Thiers region in FRANCE by skilled workers to ensure a professional quality craft finish. A Carbon-Steel knife has exceptional cutting power, but it requires special maintenance. When using or washing your carbon-steel knife, wipe it dry with care to avoid the rust. NEVER put carbon-steel knives in the dishwasher. In use, the steel can change color. This is quite normal. 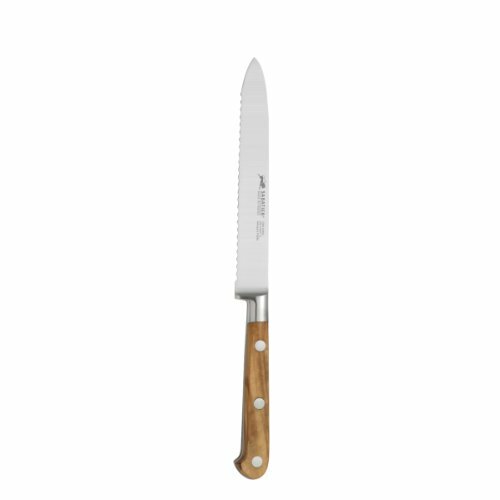 Ideal for cutting and preparing meat and large fruit and vegetables. Great Balance lets you work on food in detail to achieve a professional result. Please note these knives are very unique, hard to come by, and not for everyone. They do require proper care. If not maintained correctly THEY WILL RUST. Authentic Sabatier Forged Knives. The whole knife is forged in a single mass of CARBON steel. The steel, Rockwell 54-56 HRC, is tempered, ground and polished crosswise to produce a high-quality tool, great cutting power, cutting hardness and balance. POM handles are manually set and mounted on the tang using three through rivets. From forging to packaging, we guarantee that all our operations are performed in the Thiers region in FRANCE by skilled workers to ensure a professional quality craft finish. A Carbon-Steel knife has exceptional cutting power, but it requires special maintenance. When using or washing your carbon-steel knife, wipe it dry with care to avoid the rust. NEVER put carbon-steel knives in the dishwasher. In use, the steel can change color. This is quite normal. Ideal for cutting, peeling and preparing meat and large fruit and vegetables. Great Balance lets you work on food in detail to achieve a professional result. Please note these knives are very unique, hard to come by, and not for everyone. They do require proper care. If not maintained correctly THEY WILL RUST. 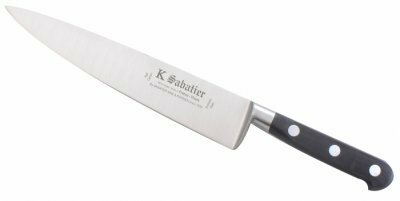 Make everyday prepping and cooking tasks easier with the Sabatier Serrated Utility Knife. High carbon stainless steel blades resist rust, keep their edge longer than conventional stainless steel, and are easy to hone and maintain. This knife is perfectly weighted and balanced for control. It's an ideal tool for everyday dining. This knife is not dishwasher safe. Hand washing is recommended. A lifetime limited warranty ensures years of use. These knives are not dishwasher safe. Hand washing is recommended. 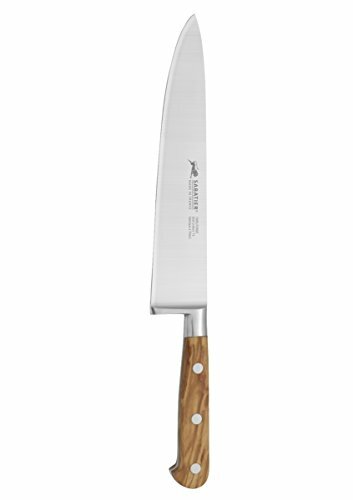 Designed for durability and precision, the Sabatier Olivewood 8-inch Chef Knife features a classic wood handle that is an attractive addition to your kitchen. The knife has a high-carbon stainless steel blade and is perfectly weighted and balanced for control and ease of use. Hand-wash with warm water and a mild detergent; rinse and dry immediately. 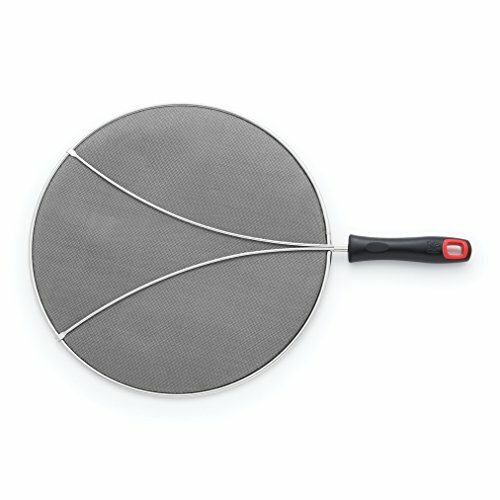 Keep grease in the pan and away from your clothes with this Splatter Screen by Sabatier. Features an activated carbon filter which absorbs unwanted odors during cooking, while keeping stovetop and counter-tops clean. Dishwasher safe. Sabatier Edge keeper knives feature a sheath with innovated technology that is designed to automatically sharpen the blade with each use. The Edge keeper protective sheath contains a built-in mechanism that hones the blade before and after each use, maintaining a blade's razor-sharp edge. The blade is made from high-carbon steel that lends strength, sharpness, and durability. Knives are not dishwasher safe. Hand-wash with warm water and a mild detergent; rinse and dry immediately. 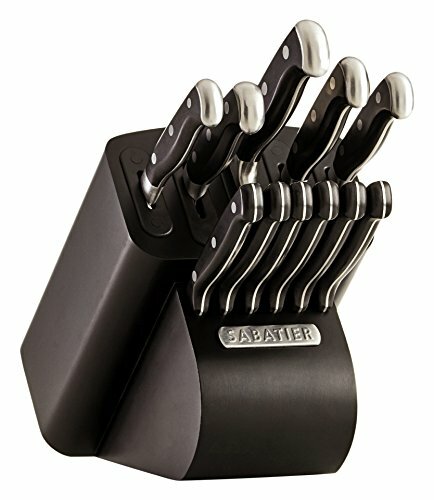 Compare prices on Sabatier Carbon at ShoppinGent.com – use promo codes and coupons for best offers and deals. Start smart buying with ShoppinGent.com right now and choose your golden price on every purchase.